I got a phone call from a very shaken kayak fisherman who was recently harassed by a very large white pointer shark while fishing around 800 meters offshore on the east coast of Northland. The white shark started it's relentless harassment of the kayak while the fisherman was hauling in a boat longline (yes it was one of ours) with fish on. The great white was taking or mauling the fish on the longline right under the kayak as the line was being hauled in. In a bit of a panic and keen to put some distance between himself and the agressive shark, the fisherman quickly cut away the longline and accidentally sliced himself deeply above the knee in the process, this cut bled profusely. The fisherman, obviously shocked by all this, then paddled very slowly away from the longline. Unfortunately, once the line was cut the shark shifted all of it's attention onto the kayak, it started by circling, and then bumping against the kayak. Occasionaly the shark would submerge only to come up from the depths and bump into the kayak from below. The fisherman then put all of his remaining bait and burley into a plastic bag and tossed it well away from the kayak in the hope that this would divert the sharks attention, it almost worked as the white pointer went over to investigate the cause of the splash where the bait bag had landed, but to his horror it returned seconds later. During the worst parts of the harrassment the fisherman was nearly knocked out of the kayak by the huge shark several times and had to put his legs over the side and into the water to regain balance. He also vomited several times during the attack, probably due to the shock of being exposed to a serious and life threating situation for such an extended period of time. In all the shark hit the kayak between 15 and 20 times with different parts of it's anatomy including the body, dorsal fin and tail. When the fisherman was only 150 to 200 meters offshore the back of the kayak was hit violently and the stern momentarily went under. As soon as he had regained balance the fisherman poured on the power with the paddle and, as he reached the shallow weed line near the rocks, he glanced over his shoulder to see the massive white pointer close behind, but veering away to avoid the reef. The fisherman describes the shark as having a shiny, almost jet black top and very white undersides. He mentioned the pectoral fins and tail were huge and he was adamant the tail was positioned vertically on the shark (which rules out a killer whale or other dolphin). He said the dorsal fin never rose higher than 300 to 400mm above the water although, as the back of the huge fish never broke the surface, it could have been longer. He also noted the front of the head was flat and not pointed, this may rule out a white pointer, otherwise a great white would fit the rest of the description perfectly. Ed : The shark has subsequently been identifed as most probably being a big female great white or white pointer by the shark experts at Kelly Tarltons Marine Aquarium. This white pointer was huge, on one pass at right angles and just under the center of the kayak the fisherman noted the width of the head was greater than the distance from the back of his seat to the front of his foot rests, his estimate is a meter or more between the eyes. On this pass the dorsal fin hit the kayak amidships and almost capsized it. As for the length he noted that the shark tail extended "five to six feet" behind the stern of the kayak when the head of the shark was level with the front. He said the kayak is "twelve and a half feet long" so the shark must have been between 17' 6" to 18' 6' long or 5.33 to 5.64 meters! Struggling hooked fish is probably the most powerful shark attractant available. Sharks can pick up vibrations from struggling fish from kilometers away almost instantly. This is probably what brought the shark to the boat in the first place. When the shark arrived it took some fish from the longline. This very likely put it into a feeding mode, the added smell of blood in the water from the fish it had mauled would have probably kept it very interested in everything in the area. Blood from the bait and burley thrown overboard, and any that was being washed off the deck of the kayak, plus the vomit and bleeding from the badly cut knee would have all added to the sharks curiousity in the kayak. If you are kayak fishing with a longline, I would suggest baiting the line on shore, or at least have the bait cut up and in a waterproof container on the kayak, so that line setting times and bloody mess are minimised. When hauling the line, do it as quickly as possible and iki or kill the fish as soon as they are landed, as the vibrations of a dying fish on deck will be amplifed by the hull. Keep all fish and bait as well as any burley in leak proof containers. Doing this will make any blood and offal less likely to leak or wash over the side and possibly set up a burley trail leading straight to the kayak. The massive shark stayed in the bay for a considerable time after the incident. The hapless fisherman watched the shark, along with about 40 other locals and holiday makers, from a nearby hill top. One of the visitors video taped the shark still circling the area where the incident occurred. If anyone has photos or video we would appreciate a copy to go with this article. Since Paul subscribed online to Buoy Weather preparing for our kitefishing trips has never been easier. We now receive an e-mail alert direct from the Buoy Weather Service each time a northeasterly is headed our way. With about 5 to 7 days notice of when the winds are due to strike, we can always plan our trips well in advance. Around the 20th of December we got a "Go kite fishing" e-mail stating moderate to strong north easterlies would be prevalent on December 29th. With the easterly winds being so few are far between this year, we didn't want to miss this opportunity. After a phone call to Trish Rea to ensure she could get the day off, Paul and I made sure our fishing gear was intact and ready to go. High tide on the 29th was about 12:30pm so we headed onto Muriwai Beach at 9:00am in order to safely get up the beach to our favourite spot north of Rimmer Road. The winds just couldn't have been any better. Dead straight offshore blowing around 20 to 25 knots with gusts up to 35 and more. The surf was practically non-existent and surprisingly, the beach was fairly deserted except for half a dozen other kite fishers. As Paul has always managed to catch a kahawai or two from his first set, we'd only picked up two fresh mullet for bait from our local hawker. We used a large 65kg dropper rig and initially we launched the Nighthawk kite. The kite darted violently across the overcast sky as it struggled with the huge gusts coming through. A smaller kite was definitely in order. We retrieved the Nighthawk with some difficulty and launched the smaller Super Kite. It rocketed up without any problems and flew perfectly downwind. We baited up 20 hooks with fresh mullet, attached a near full two litre bottle of sand, a couple of 8oz weights and let her rip. It didn't take long to set the gear out to around 600 meters offshore. We figured that with the surf being so low the big snapper were bound to be in close munching on the shellfish close to shore. After leaving the gear to fish for only 30 minutes it was time to retrieve the line. The 65kg line was as a tight as a piano wire and a loud humming noise came from it in the gusts. Getting the gear back in was a mission, in addition to the phenomial pull coming from the kite, something big out there was just not keen on coming to shore. A few steps up the beach, stopping when the load came on, a few steps backwards as we got pulled back towards to sea, and then a few more steps forward. Finally the dropper line was within reach, then, after a few more pulls up the beach there was a huge commotion from the waters edge. As I watched from the beach reel 20 meters away, three very large grey shapes thrashed around in the surf, followed by Paul as he jumped and splashed about trying to both release the sharks and avoid getting bitten in the process. Our first set of the day had returned two large hammerhead sharks, a school shark and three bitten off traces. It has been a while since Trish has been kite fishing and she was excited to see these fish come in, even if they were sharks. Trish couldn't wait to help get the next set out, well aware that some good fish have been caught off Muriwai lately. After untangling the hook section, re-tying the lines where the sharks had all but bitten through the line, we baited up again. Keeping our baits smaller this time we set to the full 1000 meters offshore. The winds had increased further, but still the kite sat like a dot in the sky. Our second set of the day faired much better. We returned 5 good sized snapper ranging from 1kg to 2.7kg, one stingray, another hammerhead shark, but still no kahawai. The third set had to be baited with stingray wings. Another 20 hooks were fired offshore in no time at all. As the skies became darker and the winds intensified further, we hauled in our third set of the day. With only 6 empty traces up on the beach, the line went slack. We'd lost the rest of the hook section to sharks. We hauled down the Super Kite and packed away the rest of the fishing gear, very pleased that with the addition of just another hook section, we'll be in action and ready to go again next time Buoy Weather e-mails us. While our first set was fishing Paul went up the beach around 500 meters to help John Dennis who was having difficulty launching his Nighthawk kite powered dropper rig in the strong winds. After about 10 minutes we saw Johns' Nighthawk kite soar skyward with a drogue attached by a bridle to the wing tips. In almost no time the kite had towed out Johns rig and his kite flew flawlessly for the rest of the day. Turned out that John couldn't have picked a worse spot on the beach to launch a kite. Turbulence from a gap in the cliffs spiralled around the beach like mini tornados. By just walking the kite further up the beach to launch plus a few simple adjustments and the gear worked perfectly. Later on Paul went back up to to see how John had got on and was pleased to find he had caught a couple of nice snapper (Photo Above) and had re-set the gear for more. If you wish to claim the electric kontiki contact us. Please include the make and model of your lost electric kontiki and provide details of where it was lost, how it was lost and any indentifying marks etc. It was a boys weekend away and a chance to try a dropper rig at Waipu for the first time. Kevin, my fishing buddy's main job was to bring the coms in case of no wind and we would kayak out, he forgot, this should have been a warning. 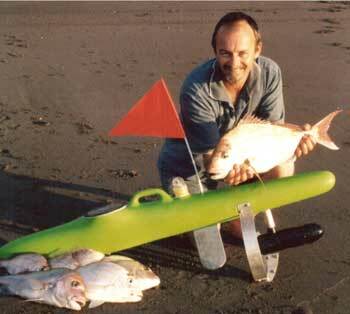 We get to Waipu and no wind, we set up the gear, bait the hooks and I get the Kayak ready to go. Kev's next job is to watch the winch while I paddle out to stop any tangles. Off I go and Kev starts to talk to two other guys. I'm powering out through heavy swells and, too late Kev notices a tangle, two clips had come apart. I was towing the entire dropper including the flag. Kev grabs the end from the winch and runs after the fast disappearing line to the kayak. He's waist deep in water, somehow finds and grabs the other end and has both ends about a foot apart about to clip them together. Just then I get a flat piece of ocean and power into my strokes and rip the line from Kev's grasp. Kev yells his head off, but I'm gone! I paddle out about 1 1/2 km and drop the line, hooks and sinkers (and flag), head back, catching a great wave in, don't fall off and then get told what had happened. After a few quiet words between me and Kev as to who was to blame, we decided to head back to the cottage and not say a word of what happened, until now. Cost to replace the lost gear $120, cost to self esteem immeasurable. I went to Kawhia with a Powertiki-400 on the 3rd of January and fished half way along Kawhia Ocean Beach. The moon was in it's last quarter and a swell of around one meter was rolling in. I did two sets of 25 hooks with the Powertiki and the gear went out perfectly straight both times. The first set was about half way through the falling tide and was baited with squid. We left it to fish for 30 minutes and this set produced eight snapper up to 3kg. 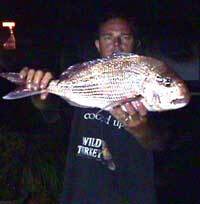 The second set was right on the turn of low tide and after 30 minutes produced 5 more snapper up to 2 kg. We fished our Paul's Fishing Kites kite longline rig at Porangahau. We used salted mullet baits on our Target 4/0 snapper hooks and fished in strong northwesters through a moderate surf and rip. The tide was coming in. We set 25 hooks three times and the gear set almost straight offshore. At the end of the day we wound up with ten gurnard, two kahawai, two sharks and three other fish. 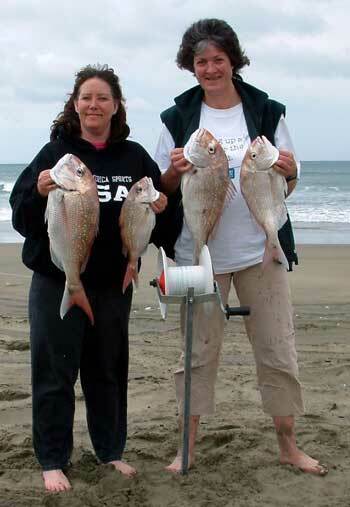 Hi All, Petra and I recently done a fishing trip up to Whangarei. The spot we fished is the end of Mair Road which is near the oil refinery. Out from this spot you will see Marker Buoy Number 6, we ran the line safely clear of the buoy. We did three sets in all and caught a good range of fish. No other kite fishers were up this end of the beach, they were all down towards Ruakaka. I don't know why no-one fishes this end of the beach, you simply put your kite out off the top off the hill if the wind is light, the beach is a very short walk and is right at the bottom of the hill. I recommend fishing close to the Number 6 buoy, but not so close that you risk snagging it. Dropper rigs are the way to go here as they will allow you to get closest safely. This end of the beach is at an angle to the rest of the beach and should be very easy to fish in northwest winds which can be difficult to fish further down the beach. Sorry the pics are so dark but they were taken at night. 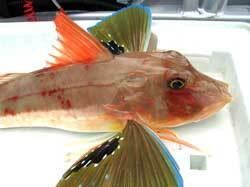 I got two of these giant gurnard at the mouth of the Whangarei Harbour early in the new year on my boat longline. I will never throw away another gurnard head. Put the heads (and leg/wing assembly) lightly salted in the quick smoker, you will be amazed with the flavour.